The Green Industry Show and Conference (GISC) returns to the Edmonton Expo Centre Nov. 15 and 16, 2018. The GISC is Alberta’s largest trade show and conference for professionals in landscape, horticulture, and nursery trades, with an average of 2,300 visitors. “The GISC is where our industry comes together for two days of education, innovation, and connection,” says Landscape Alberta’s Executive Director, Joel Beatson. New to 2018 are Just in Time sessions, where Landscape Alberta members and past attendees suggested topics they most wanted to see at the conference. “This is an exciting way to ensure we capture the pulse of the industry by providing the right session at the right time,” says Beatson. Attendees can also choose a pre-conference add-on option for more in-depth development, with four pre-conference workshops on Nov. 14. Choose from the Certified Irrigation Technician Preparation Workshop, Alberta Greenhouse Grower Association’s Day of Discovery, Building Your on Page Strategic Plan for 2019, or the Assessing and Modifying Urban Soils workshop. Attendees can also browse the largest industry trade show on the prairies, with over 200 booths featuring the latest products and technologies from exhibitors across North America. Landscape Alberta members who pre-register receive free admission into the trade show and preferred pricing on conference registration. Register before Oct. 24 to receive early bird rates. The Green Industry Show and Conference is hosted by Landscape Alberta; a non-profit organization that supports and represents the landscape horticulture industry in Alberta. Visit greenindustryshow.com for more information and to register. Krista Strating of Hamilton, Ont., earned the Women’s International Tree Climbing Championship (ITCC) title for 2018. More than 70 male and female arborists and tree climbers from 20 countries competed at this year’s event, held Aug. 3-5, in Columbus, Ohio. James Kilpatrick of Hamburg, Germany, won the men’s world title. Strating bested other female climbers in five preliminary events, each of which simulated work-related tasks when pruning and caring for trees. She was among female competitors who scored the highest in the preliminary events to earn a spot in the Masters’ Challenge championship round and battle for the title of women’s world champion. ITCC competitors are some of the best in the industry who earn the opportunity to compete by winning local and regional competitions held by International Society of Arboriculture (ISA) chapters and associate organizations around the world. Strating’s prior titles include the 2014 and 2017 Women’s North American Tree Climbing Champion. 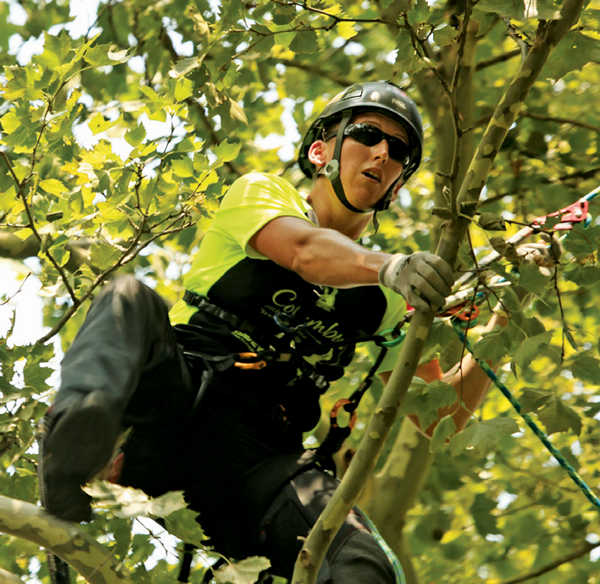 The 42nd annual ITCC, organized by the ISA showcased these industrial athletes to educate the public about professional tree work, and the training and expertise it requires to be done safely. Echo received recognition for three of its newest products in the annual Pro Tool Innovation Awards (PITA) program. The program seeks to discover and recognize the most innovative tools in the residential and commercial construction industry across a wide variety of categories. A panel of professional tradesmen and trade media representatives from the U.S. and Canada identified the new BP-8010 Backpack Blower, the PB-2620 Handheld Blower and the SRM-3O20 Trimmer series. Echo is a subsidiary of the Japan-based Yamabiko; the company’s Canadian operations are headquartered in London, Ont. A leading Toronto-area garden retailer, Humber Nurseries of Brampton, Ont., has sold its land in a deal closing December 2019. A new Humber Nurseries business is planned for a 2020 opening in Caledon, Ont., focused on wholesale/landscape trade supply. Proven Winners has released its 2019 Recipe Guide for professional growers. The guide includes everything from creative design tips to critical production knowledge crafted by lead growers. Planting diagrams for nearly 200 recipes that utilize new varieties for 2019 are pictured in the guide. Recipes containing the Annual of the Year, Lemon Coral sedum, as well as the full National Recipe program, are also featured. Proven Winners also provides grower hotlines in the U.S. and Canada to field questions about producing premium quality hanging baskets and containers at provenwinners.com/professionals/hotline. Takeuchi-US announced SMS Equipment as a new dealer. Headquartered in Acheson, Alta., the dealer has over 35 locations across Canada and one in Anchorage, Alaska, to support Takeuchi. SMS will carry the full lineup of Takeuchi products, including excavators, skid steer loaders, track loaders and wheel loaders, in addition to stocking parts and performing equipment repair. Established in 2008, SMS Equipment promotes advanced equipment technologies that result in cleaner, more efficient ways to build communities, create infrastructure and develop resources. Ariens Company, which includes Ariens, Gravely, Countax and Westwood products, is rebranding to AriensCo. Established in 1933, AriensCo is based in Brillion, Wis.